After the season opening in the Austrian glacier of Soelden, it was time for the slalom specialists to start their season and so it was high time for them Levi to come. Up in the very north of Finland the "black Levi" was ready and majestically prepared for the WC and maybe the good lightening, the great public and the very nice ammount of snow in the lovely town, but the atmosphere was the best on for these very first slaloms. On saturday it was women's turn and the very question was about who could have bothered Marlies Schild after the amazing season she once again scored last year in the short gates of slalom. The austrian star had bib number one and so immediatly everyone was ready for another great display of technic, but this time surprisingly her race was much shorter than her opponents' just because she had gone out beforetime. Immediatly the chance of a win seemed very much possible for a lot of girl up at the start and so every one of them fought hard against the very difficult setting of the first run, in order to make the best out of herself. Austrian disappointment for Schild's turnoff was soon increased by a very poor performance of Michi Kirchgasser and then another exit from Zettel. Out of that few exits, not many surprises signed the first run as local champion Tania Poutiainen was leading the race with a little gap over Maria Riesch -who looked far better than a couple weeks ago in GS- and American Mikaela Shiffrin. In the second run a couple of great runs were shown by the girls who clearly were disappointed after their first run. That was the case with Canadian Gagnon, rising from 18th to 10th place and Zuzulova, who as usual displayed an amazing feeling with flat parts scoring a terrific time that almost looked unbeatable, until Tina Maze came down and took the leadership. The two led the race for a very long while, so that only the virtual podium was yet to go down, but then all three of them could stay ahead of the come-backers and the Slovakian ended 5th and the Slovenian 4th. American young talent Shiffrin looked very strong-minded and could confirm her 1st run placement with a very brave 2nd run, snatchig the 2nd podium of her carreer being only 17! Maria Riesch had a lot of experience on her side and a little advantage from the first run, but that alone wasn't enough to take the lead and try to grab another WC victory, she had to ski errorless and so it was, she ended her run with a very solid run that secured her the lead, but would that be enough against local favourite Poutiainen? Tania started the 2nd leg with a terrific upper part adding precious hundreds to her leading, but as the steep started she lost a little determination and a couple of mistakes cost her the lead, but with experience she still could end 2nd. THe real winner of today's race is Sarka Zahrobska though, who suffered a brain surgery this summer, but still she was able to compete and quite well considered all she's been through, bravo Sarka! The day after it was about men to face eachother on the Finnish slope, but even if the first 4 position after the first run didn't change by the end, the race was even more spectacular than the women's one. A lot of uncertainty was in the air throughout the race and it was not only about the fog, but all the racer showed a very great form already and the gap needed to quality for the 2nd run was so small that everyone almost had a shot for a good result before the 2nd run to start. Surely aware of that it was Austrian Reinfried Herbst, who got in last-minute thanks to his team-mate Matt disqualification. 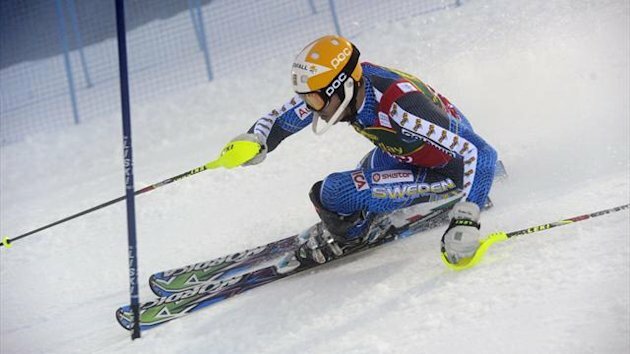 Herbst took advantage of the perfect conditions and risked it all by attacking from the very first gates till the end and his run made him climb more than 20 places in the ranking as he finished 6th. Italian Giuliano Razzoli took advantage of the low number in the 2nd run and could rise from 29th to 13th place, whilst Norvegian young hope Kristoffersen - year of birth 1994- rose from 24th to 11th. It was just when the top 10 was to start that Herbst leading was broken though and it needed a terrific run by Italian Patrick Thaler to do so, but the two kept rising the ranking together for quite a few runs more. The top 5 racers of the first run were the only left and the two above were still on the lead, Russian Sensation Aleksander Khoroshilov looked a little too cautious after the amazing first run (5th starting with bub 45) and sadly for him this attitude didn't pay off as he eventually finished only 18th. Italian Moelgg, 4th after the 1st leg, had a completely different attitude and attacked with no fears and could overtake his team mate in the leadership, but it didn't last longer as Swedish Byggmark skied an old-fashioned runs of his and despite a couple of big mistakes he still could secure himself of the podium. Austrian Marcel Hirscher looked unbeatable when he ended the second run's course, as he showed some incredible agility down the steepest part of the slope, but 1st run leader and last year's Slalom cup winner Andre Myhrer had other weapons on his side and by painting amazing lines in the top flat and pushing hard like only he can do in the bottom, he still could overtake on the Austrian and took the Levi's slalom.